Monkfish or “ankou” 鮟鱇 is not a very popular fish in the U.S. and unlike in Japan, the only portion of fish being sold and consumed is the tail meat. For Japanese, the most precious part of monk fish is, of course, the liver. The most common preparation of ankou in Japan must be ankou nabe アンコウ鍋, in which most of the various parts of the fish including skin and liver beside the meat are used. Here is the iron chef Morimoto showing off his skill of disassembling this rather ugly deep sea bottom dwelling fish. In any case, we have not seen monkfish for some time in the grocery stores but, the other day, we happened to come across fresh monkfish fillets at a near-by market and got it. 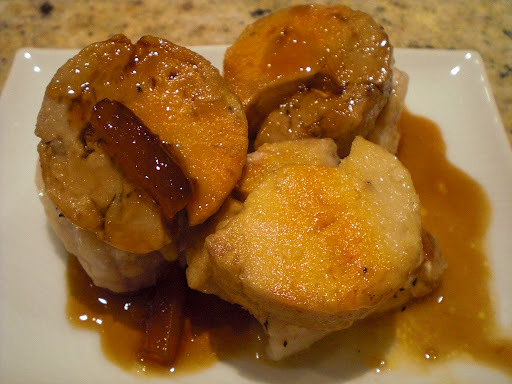 I have posted several ways of cooking monkfish fillets as well as liver (not raw but previously processed and frozen, which is the only monkfish liver I can get my hands on. Since we had a package of frozen monkfish liver or ankimo あん肝 in the freezer, I decided to make a dish with the both monkfish fillet as well as liver. Monk fish fillet: I removed the grey slippery membrane which covers one side (skin side) of the fillet without wasting too much meat underneath. If you do not removed this, it will became a tough membrane after cooking and will also shrink more than the meat. I marinated the cleaned fillets in sake for 24 hours (Since I could not cook this immediately, this is a good way to preserve and also removed any fishy smell). Next day, I removed the fillets, dried them with a paper towel, cut into 1 inch think medallions. I seasoned with salt and pepper. 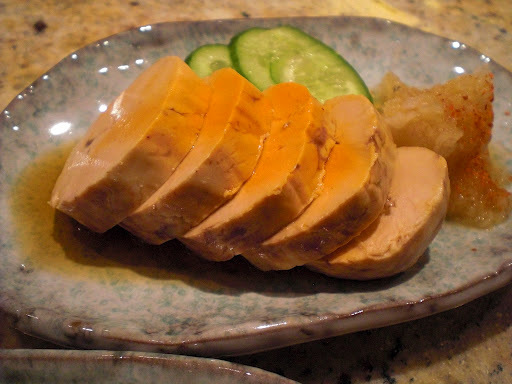 Monk fish liver: This comes in a cylindrical shape in a plastic wrap (shaped into cylindrical shape and steamed) then vacuum packed in an aluminum pouch. I just defrosted it in running cold water. I made 1 inch thick medallions to match the size of the monk fish fillet medallions and dredged in flour. Cooking: I put light olive oil in a frying pan on low heat and fried three garlic cloves (smashed) for 5-8 minutes until the garlic flavor is transferred to the oil. I then took the garlic out of the pan. I turned the flame to medium high and put in the monkfish fillet and liver medallions. I cooked for less than one minute on each sides and finished in a 400F oven for 5 minutes. After 5 minutes were up, I let it rest for 5 minutes (This is one of the rare fish which, like meat, benefits from resting after cooking). Sauce: I thought about making a Ponzu-based sauce but settled for my ususal sauce made of orange marmalade and soy sauce. I first put orange marmalade (3 tbs, I used a “fancy” marmelade with large orange peels in it) in a small frying pan on low heat and added just a small amount of hot water (1 tsp) to facilitate the melting. When the orange marmalade was melted, I added soy sauce (1 tsp). This may sound like a very sweet sauce but it goes well with monkfish liver (or duck breast). I placed three medallions of monk fish fillets on the bottom and topped each pieces with monk fish liver and drizzled the sauce as you see in the first picture. This is a great dish if I say so myself. The firm texture of the fillets is like lobster tail and the liver is like foie gras, soft, buttery and unctuous. This combination is sublime and the sauce went perfectly. Although this dish could go well with a nice acidic and crisp white wine such as sauvignon blanc, we were drinking cold sake at this point, which was great with this dish. Of course, before this dish, I served ankimo in a very simple traditional way with ponzu, grated daikon which was sprinkled with Japanese one flavored red pepper flakes or ichimi tougrashi 一味唐辛子. This was mighty fine too!